KBSS can access portable three-axis milling machines. The family starts with the PM4200 – a versatile model with available bed options of 20, 49 or 78 inches (508, 1244.6 and 1981.2 mm) of travel. Our largest mill, the LM6200, features the ability to configure for linear AND gantry milling, with up to 84 inches (2133.6 mm) of x-axis travel and 34 inches (863.6 mm) of y-axis travel. There is plenty of spindle torque for fast metal removal and the capacity to mill in nearly any position. Our portable three-axis milling machine family starts with the PM4200 – a versatile model with available bed options of 20, 49 or 78 inches (508, 1244.6 and 1981.2 mm) of travel. 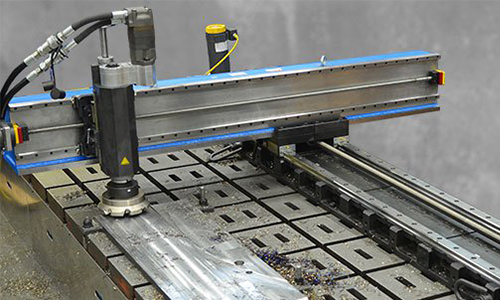 Our largest mill, the LM6200, features the ability to configure for linear AND gantry milling, with up to 84 inches (2133.6 mm) of x-axis travel and 34 inches (863.6 mm) of y-axis travel. There is plenty of spindle torque for fast metal removal and the capacity to mill in nearly any position.